The world we live in is changing at an unprecedented rate. Computers are increasingly integrated into devices ranging from stoplights to smart speakers. Intelligent sensors are collecting an immense amount of data with the potential to provide new insights about everything from our health to what motivates us. Robotics and 3D printing are reshaping manufacturing processes. Technologies such as renewable energy and artificial intelligence are significantly reinventing industries from transportation to telecommunication. The convergence of these technology changes is enabling what many refer to as a Fourth Industrial Revolution. This Fourth Industrial Revolution will be characterized by a fusion of technology that blurs the lines between physical and digital worlds and is profoundly changing everything about how we will live, work and play. These fast-paced changes make it imperative for educational institutions to consider how to best prepare students for this new world, with a balanced understanding of the complex impact that technology can have. At Georgia State, we have improved student success and significantly increased students’ graduation rates. However, this is not enough. Our goal is to ensure that every Georgia State student is ready to flourish and thoughtfully contribute in this new world of the future. While digital skills are a key part of educating students for the Fourth Industrial Revolution, we cannot lose sight of the human element and the increasing importance of collaboration, communication and compassion as we become more technologically advanced. At Georgia State, we have been working diligently on programs and initiatives to address this issue. When I joined the university five years ago, we launched our digital literacy initiative to incorporate digital skills and competencies into our core curriculum. For example, students learned to write and format blogs using web scripting in an English composition course and learned to create visualizations showing the impact of a pivotal event on varying demographics in history class. The program provided a basis for a growing community of digitally experimental faculty. STEAM Hackathon Python Bootcamp sponsored by PantherHackers. Even more significantly, students who participated in the digital literacy initiative showed us that they wanted to continue developing their digital skills outside of the classroom, specifically wanting to compete in the growing hackathon community in Atlanta. As a result, we became sponsors for and helped students start the PantherHackers student organization. This organization grew to over 400 members with majors represented from not just computer science but English, marketing, graphic design and many others. This group not only competes (and wins) hackathons but helps provide support for some of the university’s largest cross-institution technology events, such as HackGSU and the Global Game Jam. PantherHackers also acts as a peer learning community, running boot camps on digital skills (such as programming languages and introductions to concepts like blockchain), as well as soft skills (such as how to pitch ideas). As PantherHackers grew, their events routinely filled to the point where we needed to seek increasingly larger spaces to accommodate their workshops and events. 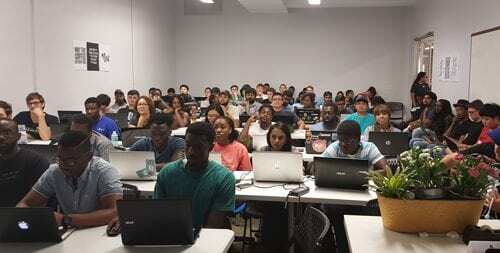 Not only were students from technical majors like computer science interested in these opportunities to gain digital skills and build with technology, but students from across disciplines sought out opportunities to engage in digital problem solving. The existence of such a broad appetite for access to digital creation tools for experimentation influenced the creation of EXLAB, the university’s first open-access digital makerspace. 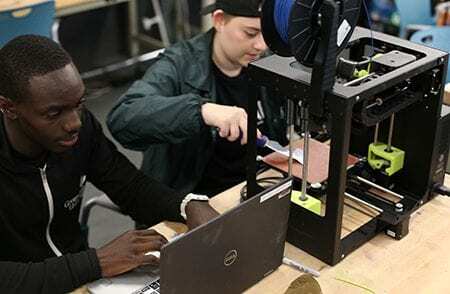 This first makerspace has since grown into multiple makerspaces across campuses. The success of PantherHackers, and the insight the organization provided for understanding students’ interests in applying digital skills outside of class in real-world and professional contexts, helped us understand the need for exploring how we could continue to prepare students for the world beyond Georgia State. Students were getting so much value and learning from the projects, cross-disciplinary hackathon teams and peer led trainings that we wanted to create more structured experiential and project-based learning opportunities. This led to the Digital Learners to Leaders (DLL) program. DLL aims to develop the next generation of digital problem solvers. Created with funding from a Digital Economy Initiative grant from the Silicon Valley Community Foundation in partnership with Cisco Corporate Responsibility, the program engages students in exploring solutions to local challenges using digitization and the Internet of Things. Cross-disciplinary Digital Learners to Leaders team pitches their idea at HackGSU. 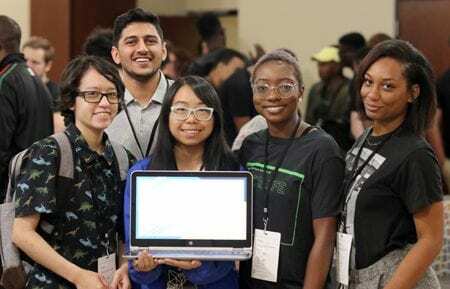 DLL was developed to encourage students, particularly women and minority students who are often underrepresented in the technology industry, to explore their technology interests. In this year’s cohort, 55 students seeking both two-year and four-year degrees in 33 different majors are attending workshops taught by technology professionals from across Atlanta’s education, business, government and non-profit community on topics such as ideation, computational thinking, project management, entrepreneurship and professional communication. Throughout the program, at hackathons and collaborative development sessions, students are challenged to apply the digital skillsets they learn to develop new solutions to problems found in their communities, empowering them to use technology to cultivate positive change. Teams of students are exploring digital solutions to problems such as developing more convenient methods of recycling using automated sensors and creating immersive virtual reality experiences that teach financial responsibility. Through collaborative problem solving, students are not only learning to apply high-demand professional skills but are encouraged to become agents of change through technology. As we consider what is next at Georgia State, we are thinking about how we can continue to enhance and improve our curriculum to include all of the successful elements of experiential initiatives like the Digital Literacy Initiative, PantherHackers, EXLAB and DLL to develop the diverse and innovative professionals of the future. What are your thoughts? Send Phil a question or comment.